Chocolate tasting theme party. Valentines day chocolate tasting. A recent study by Dr. David Lewis of the University of Sussex indicated that the sensation of melting chocolate in one's mouth produced an increase in brain activity and heart rate that was more intense than the sensation of passionate kissing. So what better way to celebrate a passionate holiday like Valentine’s Day than to explore your ardent love for chocolate, and hold a Valentine's Day Chocolate Tasting Party! Invitations really set the mood for a party, so set the mood for your chocolate tasting party with some tasty chocolate! 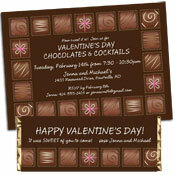 Start with a personalized chocolate tasting party invitation. Include a fun size pack of chocolate candies to sweeten the deal. Or send personalized candy bars with all the details of your get-together; and no one will send regrets. Just be sure to mail it in a padded envelope or hand deliver them. if you can join us for a treat! Please join us, it would be bittersweet without you! Jazz the invite up with chocolate scented scratch and sniff stickers, or sprinkle a little paper confetti in the envelope. Use rich colors like red and gold to create a delectable party atmosphere. Welcome your guests with a personalized Valentine’s Day cupid cutout (with your face added!). Red and pink balloons interspersed throughout the rooms create a dramatic effect for a bargain price. Set the mood with soft jazz music, love songs, or for something fun use the soundtrack to Willy Wonka and the Chocolate Factory! Chocolate comes in many varieties, so choose an assortment of different types. Chocolate experts say that the best way to test is by using chocolate bars and breaking them into small pieces, but don’t let that discourage you from including chocolate truffles, chocolate cakes, or chocolate fondues. The guest of honor at your chocolate tasting party is the chocolate, so decorate the tasting tables so they really stand out. Cover the table with a pink tablecloth to complement the delectable brown of the chocolate. Scatter votive candles across the table, and sprinkle heart confetti between the red plates piled with chocolate ready to be savored! Don't forget to set out napkins; chocolate will melt in your mouth AND in your hands! Break the chocolate into small pieces, and arrange them from light to dark. It may be wise to do the tasting in stages if you are sampling more than 15 types of chocolate, starting with the lower cocoa percentages and move toward the darker chocolates. If you start with a darker chocolate first, it will overwhelm your taste buds, making the lighter flavors more difficult to taste. Number or label all of the plates so you can identify the chocolates. Balloon bouquets will draw even more attention to the buffet, so place one in the center of the chocolate table and another on the beverage and palette cleansing table. Let your guests know it is important to cleanse their palate between chocolates - it’s hard to taste the finer points of one chocolate when you can still taste the last chocolate you sampled! Provide unsalted crackers, baguette bread, or thin slices of a tart apple like Granny Smith. This gives your guests a fresh start to the next tasting experience. A container of un-ground coffee beans is helpful to clear aromas from the nose since 90% of taste is smell. Appearance of the chocolate includes color variations, whether or not the chocolate is shiny (it should be! ), and the presence of any bloom. Bloom is the grayish discoloration chocolate that has been exposed to temperature fluctuations or moisture. Don’t worry, it’s still safe to eat and won’t ruin the taste! Aroma of the chocolate can be a surprising discovery process. Rub the chocolate with your thumb to soften it, and then take a whiff. You could find scents of vanilla, cinnamon, fruit, cedar, or nuts. The possibilities are endless! Texture is directly related to the length of time the chocolate went through a process called “conching”, the longer the time, the smoother the chocolate. Is your chocolate smooth or gritty? Does it have anything added to it that changes the texture? Flavors of chocolate can be broken into two categories, the initial flavor, and the finish flavor. What flavors can you taste when you first put the chocolate in your mouth and it starts to melt? Is it fruity or earthy? Any what about after it’s gone? What type of flavor is left as an aftertaste? Provide a worksheet for your guests to write down their observations, and compare everyone’s assessments. You’ll be surprised at the range of comments! Or better yet, print out this one I created for you and use it! Doesn’t that make life easier? Send your guests home with a sweet reminder of your party. Personalized chocolate themed candy bar wrapper will allow guests to reminisce about the great time (and great chocolate) they had. "Las cosas claras y el chocolate espeso" is a Spanish proverb meaning “Ideas should be clear and chocolate thick.” Take these ideas and throw a Valentine’s Day party that your friends and family will be talking about (and trying to walk off) for the rest of the year! Have a happy Valentine's Day from your friends at Party411.com!